At The Last Act, Art and Culture in The Time of The Environmental Crises, Art Council Norway’s yearly conference in Bergen (November 20-22, 2018), the Norwegian cultural scene discussed what significance art and culture have when the climate and the environments are changing dramatically. 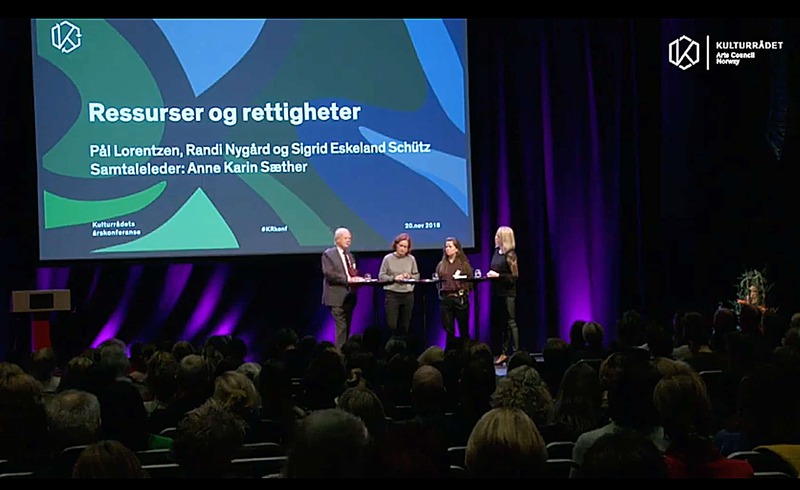 Randi Nygård took part in a panel called Rights and Resources, with Sigrid Eskeland Schütz, Professor of Law at the University of Bergen, Pål Lorentzen, Supreme Court Lawyer, and Anne Karin Sæther as the moderator. They discussed environmental regulations and laws and what role art can play in relation to these issues. The panel began by talking about why economic interests so often win over environmental concerns. Do we need better legislation and more regulations? Lorentzen said that it is obvious that the environment does not yet have enough legal protection, as we see temperatures rising, mass pollution in the oceans, and fjord landfills being approved for mining companies. Sigrid mentioned that, for instance, there is a lot of micro plastic coming from pollution from road paint in speed stripes and there is no jurisdiction concerning the issue yet. Nygård mentioned that the Norwegian Animal Welfare Act actually states that the animals have an intrinsic value which is irrespective of the resource value they may have for man. To her knowledge, this section has very seldom been used and had it been followed we would probably live in a very different society. Nygård also spoke about how Ensayo#4 worked with an exhibition and a publication deriving from Section 2 of The Norwegian Marine Resources Act, Dei viltlevande marine ressursane ligg til fellesskapet / The Wild Living Marine Resources Belong to Society as a Whole. They found the section to be both poetic and paradoxical. How can what is wild and living be a resource and belong to society? Nygård sees including poetic approaches as highly relevant when we seek to represent animals and plants better in laws and to integrate them into our societies. Among others she mentioned Derrida’s idea that if thinking about the animal is possible it must derive from poetry. Nygård also stated that art and poetry at its best does precisely this, it approches the ungraspable, it says something about that which cannot be said, and in this way it is another knowledge about the world. Artists need not make the world poetic, the relations in the world are fundamental poetic. And so is also our relation to nature, mystic in its deepest sense.